Patterned after a classic design by Ed Bosworth, Jonathan’s father, our own Boat Shuttles are made in beautifully hand-finished woods. No matter which wood you choose, you will enjoy weaving with these smooth shuttles. 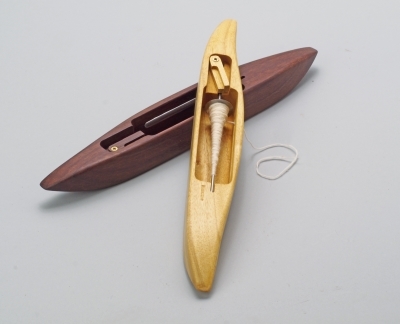 These Boat Shuttles are a perfect fit for our own Bosworth Charkha Spindles. or your own paper bobbins. Note: Our Shuttles cannot be used with the spindles from an Indian book charkha, and our Charkha Spindles do not fit the Bluster Bay shuttles meant for Indian book charkhas.